Lorraine Ayres from Somerset is currently in training to swim the English Channel at the end of June/early July 2017. She has set out on this challenge to raise money for charity (CRY) following the death of her friend in these recent months and also as a personal challenge to prove to herself that everything is possible with the right training and mindset. Lorraine has been training during last winter at Taunton pool and regularly swims for some 2 hours in the mornings. She also swam in the Swimathon but instead of a 5k swim, she swam 10 miles which took her 5 hours and 40 mins – stopping briefly only to take a drink and some fuel. Lorraine holds down a full time job so has to fit swimming and land training around this. Now the winter months are fast approaching Lorraine is currently working on her strength in her shoulders and back to ensure she is at her peak by next June with the help of the GLL Sport Foundation. Sea swimming is still continuing although proving more difficult due to the winds – sea temperature is still very warm at this time but its the getting out which makes you cold! 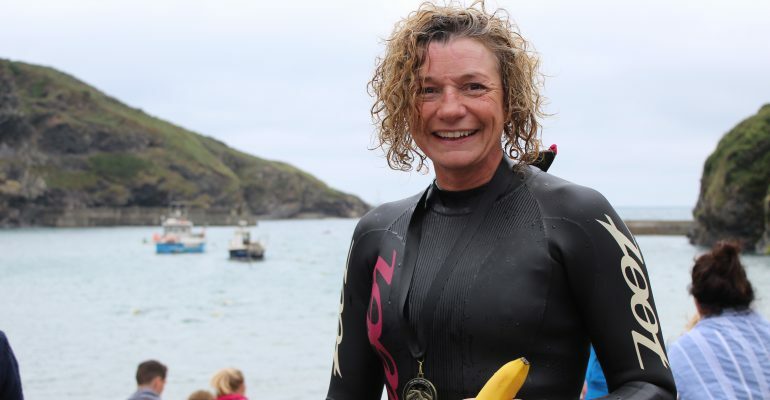 Lorraine has taken part in many open water swims throughout the summer months to ensure that she is feeling confident over a long distance in many differing sea conditions. Some of these long distance events start off calm but soon you are into very choppy seas which makes the swim more difficult and obviously then takes longer. She has successfully completed her 6 hour swim in the sea for the qualification process which you have to pass to ensure you are eligible to swim the Channel. Some 22 miles. We look forward to supporting Lorraine in the build up and are excited to see how the big swim goes!